There is nothing like keeping family traditions alive. I have always admired families who in this day and age, are proud of their inheritance and have decided to keep up the old artisan methods. Quality, over mass production commercial gain. 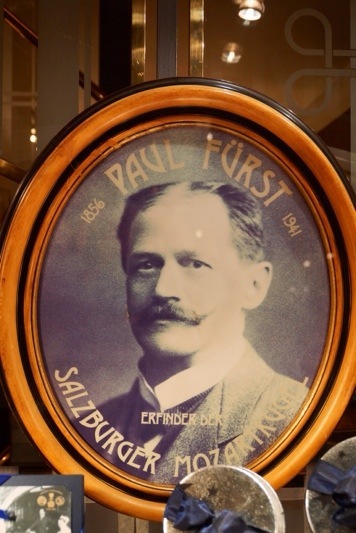 In the case of the Fürst family business which is headed now by his great grandson, it is still honouring the memory of Paul Fürst. 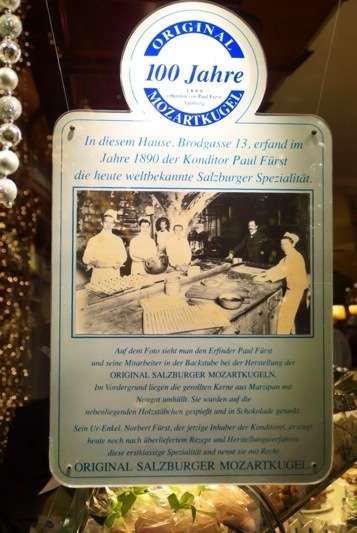 Fürst who in 1890 presented for the first time the Mozartkugeln in his shop in Salzburg. A perfectly round chocolate bonbon, an achievement at that time. As the name indicates, it was inspired by Mozart, who was born in Salzburg in 1756. 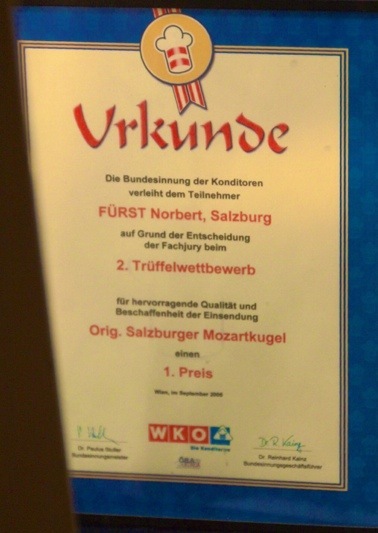 Fürst presented the Mozartkugeln at a fair in Paris in 1905 and was awarded a gold medal. The original recipe is still being used today so just imagine a delicious mix of pistachio marzipan covered by a layer of nougat lovingly shaped by hand into a perfect round ball. Each ball is then fixed on a wooden stick and immersed into a coating of rich dark chocolate. Finally, with the sticks vertically positioned and the balls on top, all is left to do is wait for it to dry and solidify. The sticks are then removed and the hole left is filled with chocolate. With the first bite, all the flavours melt perfectly in your mouth. It is a unique experience! 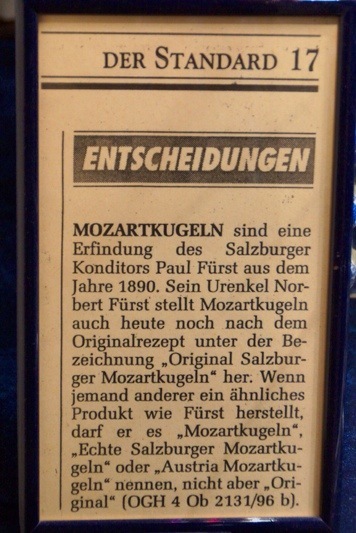 The Fürst family is the only one allowed to use the term “original” but as they never registered the patent of the Mozartkugeln, there are many copies out there. Those are mass produced, using industrial recipes that try and imitate the taste with some variations. How can you recognize the original ones from all the others you may wonder. It is not that difficult actually. 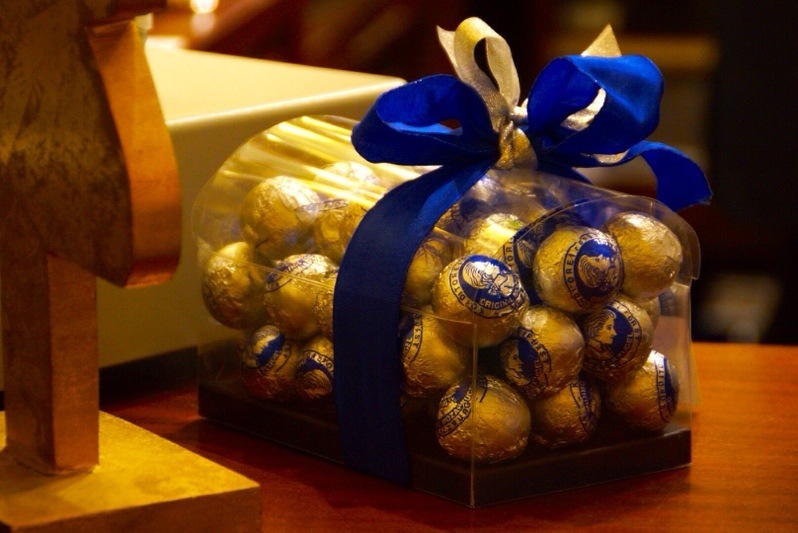 For starters the original Mozartkugel is bigger but the most identifiable sign is really the packaging in a silver and blue foil. The mass produced ones are usually wrapped in a golden and red foil and you can find them everywhere, even in supermarkets. Having tasted all the versions, the moistness in the original Mozartkugel when the chocolate layer melts in your mouth and you finally get the texture of the marzipan and the nougat is heaven! 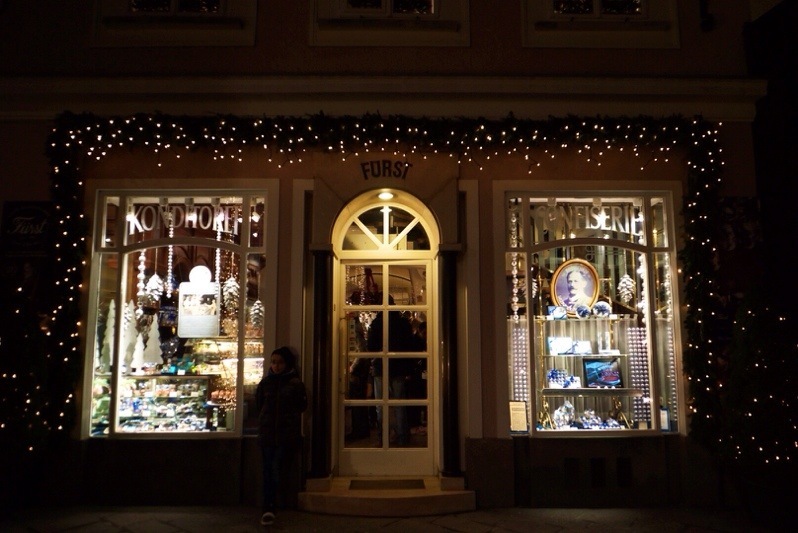 The original ones are only sold at three locations that are owned by the Fürst family and at their first shop in Salzburg inaugurated by Paul Fürst in 1884 (as well as online). If you can, I would advise you to go to the original shop in Alter Markt, Brodgasse 13. 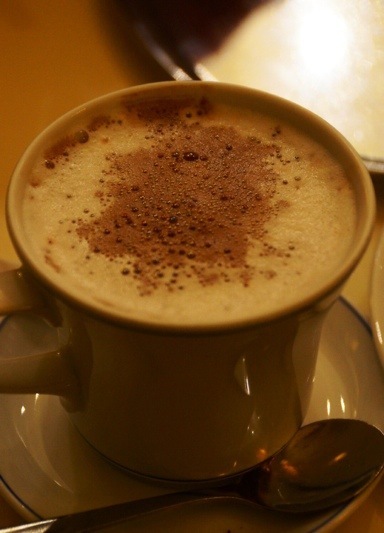 It is also a coffee shop, so you can sit, have a coffee or hot chocolate and choose from a variety of tempting cakes. 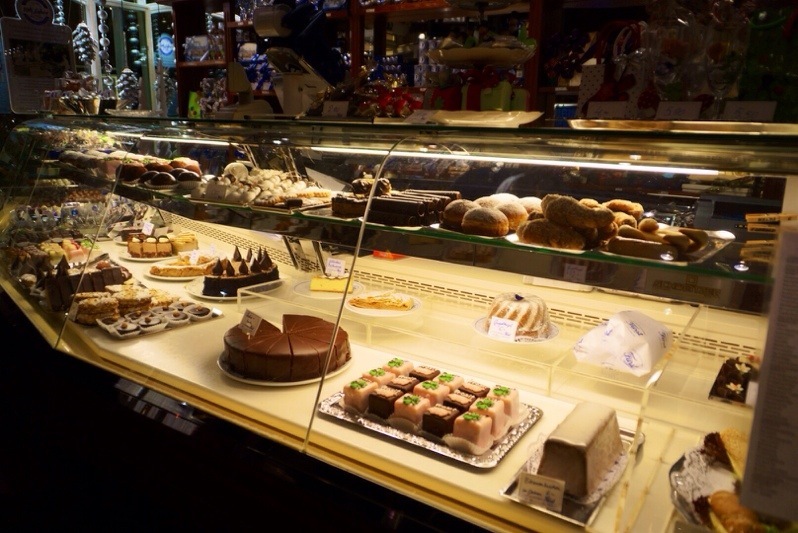 The coffee shop is always bustling with activity, as many people come to sit and enjoy the atmosphere, never leaving without the hand made original Mozartkugeln. 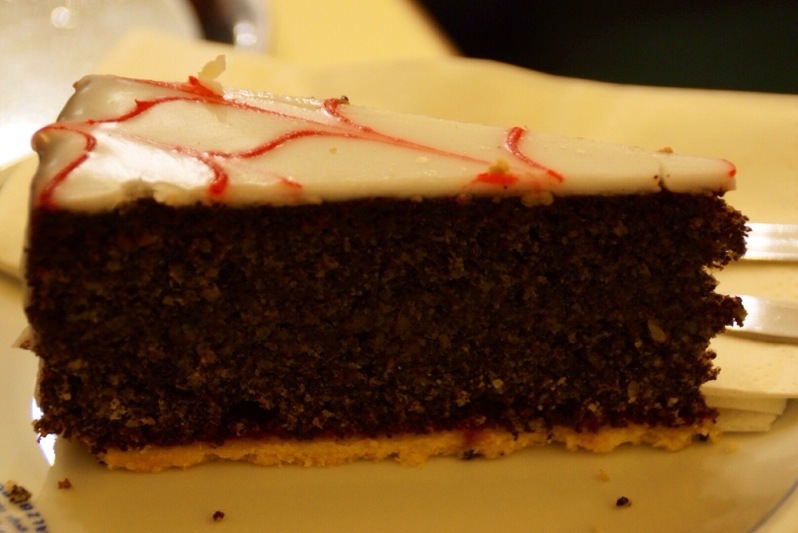 Besides the hot chocolate to warm up from the Salzburg winter cold, we chose a delicious poppy seed cake, an Austrian favourite. 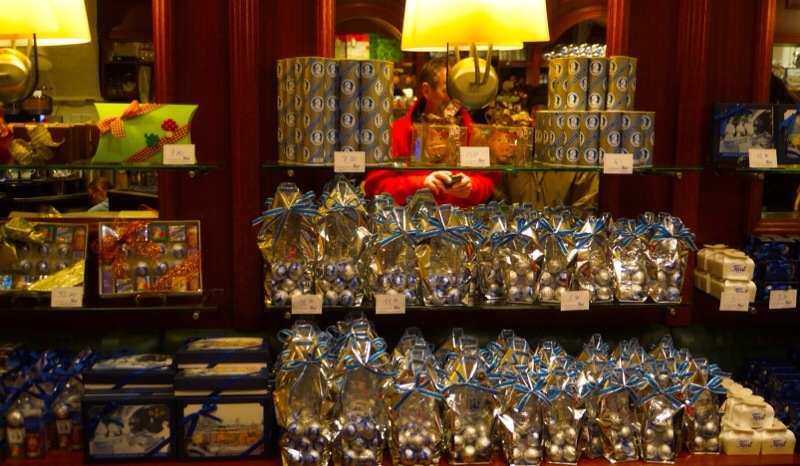 And then we could not leave without buying some Mozartkugeln to offer and for ourselves as well. As you can see, you can choose from different types of wrapping and display. Outside you can still admire the window display, where they proudly mark the 100 years of the Mozartkugeln, explaining how they are the only ones allowed to use “original” in their Mozartkugeln. Also displayed are the prizes they won. In my travels in Mexico I have also discovered other families who struggle everyday to keep up the family traditions that have passed from generation to generation. Sometimes up to five generations like in the case of my post on the Artisans of Mezcal and also my post on Chocolate tradition in Oaxaca. You have to admire the determination to safekeep quality over bigger commercial gains. 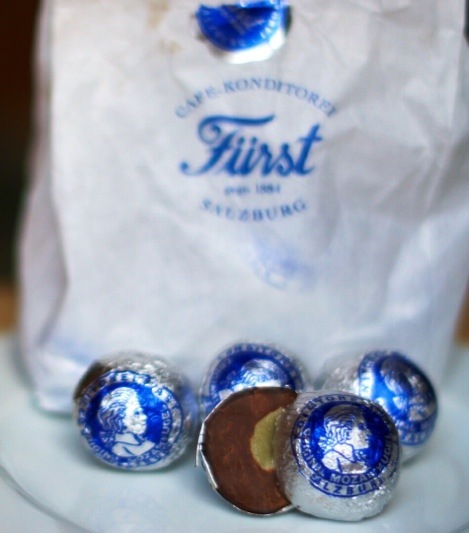 It was rewarding to find such traditions also in Austria, I will always remember our visit to the Café Konditorei Fürst and my first degustation of the original Mozartkugel.